The newly opened Gamuda Cove Experience Gallery in USJ, Taipan, is filled with lush greenery. Sunlight pouring in through the glass panels makes it brighter and seem more spacious. Gamuda Bhd deputy group managing director Mohammed Rashdan Yusof settles down comfortably in a quiet corner. He starts off by expressing his delight at the developer making it to the Top 10 list of The Edge Malaysia Top Property Developers Awards. “We are very proud and pleased. The award is a great accolade. We have great people leading the team, which are our CEO Ngan Chee Meng and chairman Datuk Chow Chee Wah. I want to give special mention and thanks to them and also the team that has built up Gamuda Land to what it is. All of them are still so hungry to deliver the best to our customers,” he says. 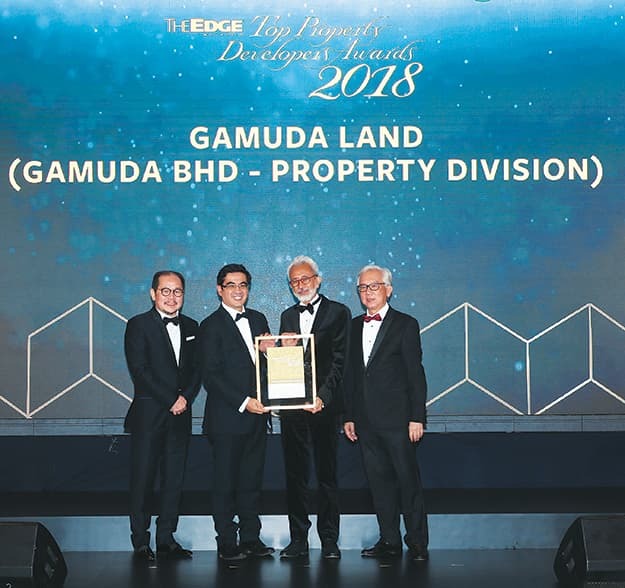 Gamuda Land is the property arm of Gamuda Bhd and is back on the list after opting out of the ranking exercise last year. The master plans drawn up by Gamuda Land harmoniously bring together all the key elements to create the personality of each town. These elements include architecture and providing the right facilities and amenities to cater to the community’s needs. 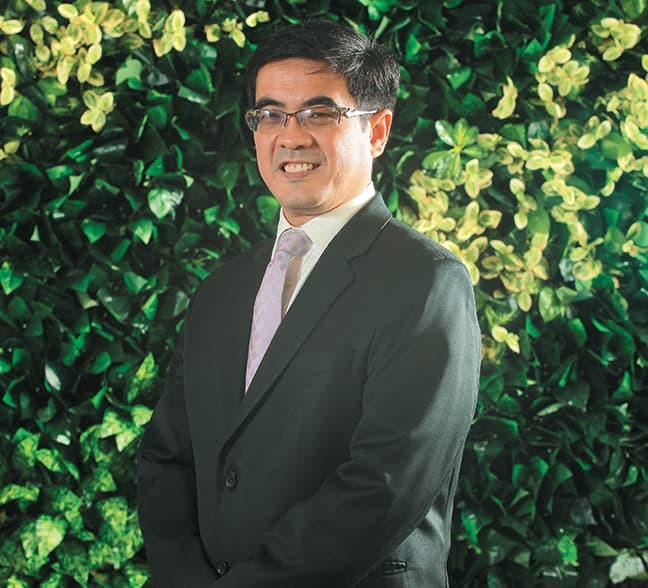 Despite the challenging property market, the developer remains confident and is continuing with township development in the Klang Valley. 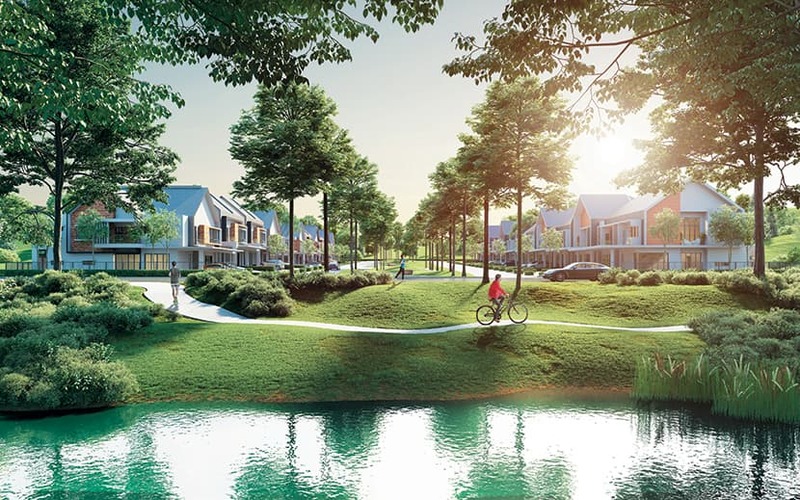 The most recent was the launch in September of the 1,530-acre Gamuda Cove in Hulu Langat, Selangor. It has also achieved success in overseas projects, particularly in Vietnam and Singapore. Mohammed Rashdan shares with City & Country the company’s current situation, and its plans and direction. City & Country: How has the year been for the company? Mohammed Rashdan Yusof: We achieved a revenue of RM3.6 billion, which grew by 50% compared with last year’s sales of RM2.4 billion. That’s on the back of a very strong performance from our overseas markets. About two-thirds of the revenue is from overseas and Vietnam is a very strong contributor. From the revenue standpoint, we hope to achieve our target of RM5 billion in sales in the next two years. A lot of that will be driven by the new developments here. Gamuda Cove is our flagship development and it is very important for us. Other developments that are the main big pillars for Gamuda Land are Gamuda Gardens and twentyfive.7. Overseas, apart from Vietnam, there is Singapore — Anchorvale Crescent in Sengkang. The good thing about these overseas projects is that the contribution from them does help. For example, (the exchange rate for the Singapore dollar) is about three to one. So even though it is one project, it accounts for a significant amount of both revenue and profits. This is why we want to have a balanced portfolio between overseas and local to maintain our growth trajectory for both revenue and profits. Other strategies and action plans to help us achieve the target include innovative and new-to-market products with future-forward master plans, enhanced branding and customer experience services, recognition by industry bodies through awards, as well as talent development to better drive business. What are the company’s plans for the international business? Our overseas markets remain an important part of our business plans with an intended 50:50 contribution from local and foreign sales. 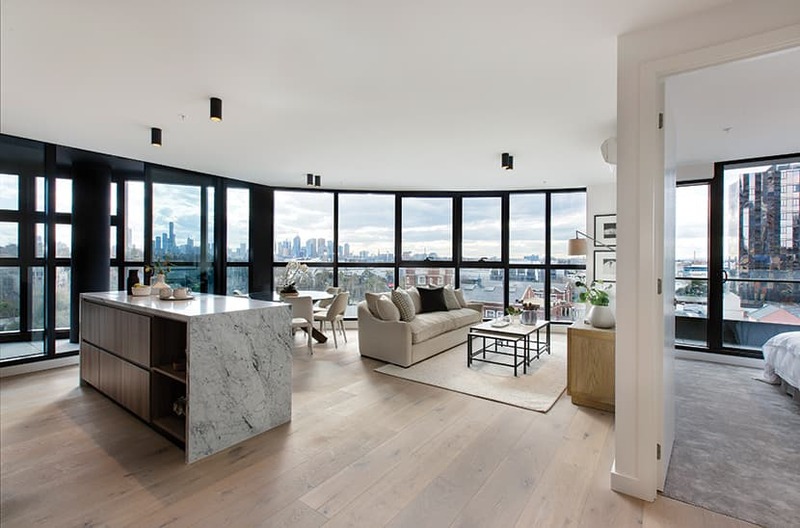 Other than Singapore and Vietnam, we also have a development in Melbourne, Australia. We are actively looking at exploring other markets. After our success in Chapel Street, Melbourne, we want to go from there. Melbourne is an interesting market that we really want to grow in. The margins are good there and the demand is very strong, especially within the local market. In general, we need to look beyond those markets and at the moment, the challenge is knowing the local circumstances of whatever market we are looking at. Some of our competitors have gone into the UK market and that is one area we might be looking at. But the key thrust is looking at markets that we already know and are strong in. So, Vietnam continues to be a focus. Not only because of the fact that we know it, but the margins there are very good. Singapore, on the other hand, is a safe and reliable market even though the margins are lower. That’s why we are also in Singapore ... because it gives us that certainty. Australia is another market that is also very reliable in that sense, but we must admit that we need to have more local knowledge. We are gaining that through, perhaps, potential associations and collaborations in the future, just like in Singapore, where we have a joint venture partnership. Coming back to Malaysia, what are the upcoming projects? In the Klang Valley, a lot of effort will be focused on Gamuda Cove, which is 1,500 acres and can last us for 15 years. The size of Gamuda Gardens is half of Gamuda Cove. Combining both, we will have almost 2,500 acres … and then there is twentyfive.7. There is a lot to do in Gamuda Cove. There is this thing call place-making where we will activate new and exciting features like a water-based theme park and Discovery Park. The theme park will be the nearest theme park to the Kuala Lumpur International Airport by 2022. Currently, we are looking at opportunities in Penang. In Johor, we have Horizon Hills. It is the signature Gamuda Land project down south and has been there since the mid-2000s. 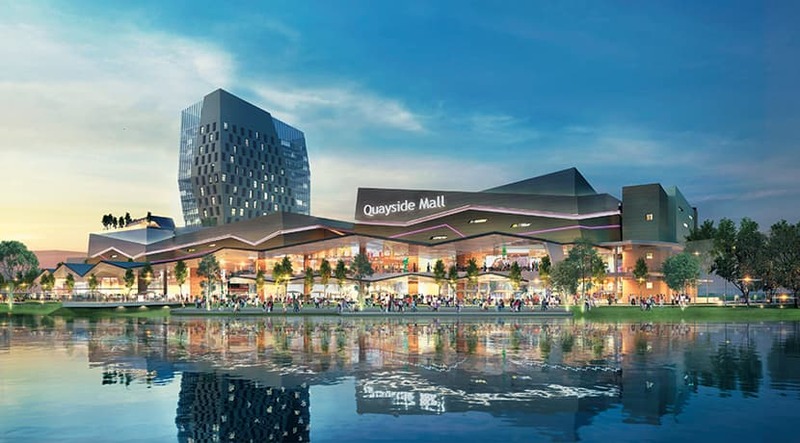 It will continue to give us growth as the Iskandar region develops. We have a project in Bukit Bantayan, Kota Kinabalu. That is an ongoing high-rise project. These are the portfolio projects we have. We are looking for more opportunities. In terms of townships, we are going to have our hands full with Gamuda Cove and we are looking at the possibility of Penang. When did Gamuda IBS (industrialised building system) start and what are its unique features? Gamuda IBS has been around for two years but the first year was a lot of learning. Now, we are really getting into the groove. 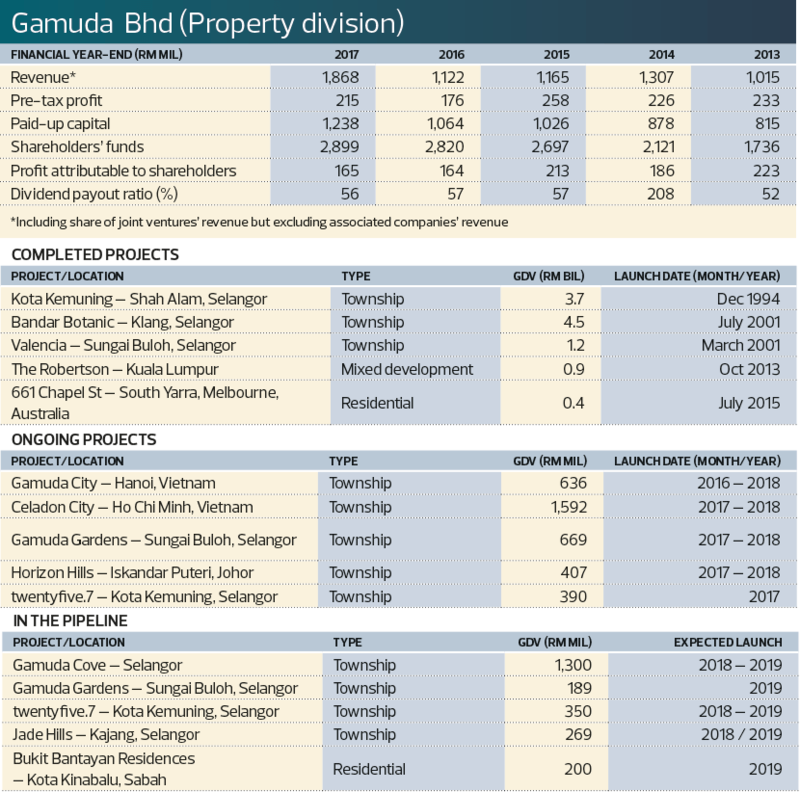 Gamuda IBS is not solely for Gamuda Land — it is for all developers. We have many non-Gamuda Land customers and we want to build it up and share it with the rest of the industry. But because Gamuda IBS is new and we want to showcase how good it is, Gamuda Land is spearheading this effort. We will always use Gamuda IBS because of its greater reliability, consistency, quality and timeliness. Our IBS is in a covered factory setting. A lot of precast systems have open yards. But ours is sheltered and not open to sun and rain, which affects the consistency of the concrete. We also have this big oven that cures the concrete at a certain temperature. A lot of the heat is generated by the concrete being cured itself. When it is enclosed, it cures better and, again, that’s where you get the consistency. You can only do this in a factory setting. We have invested a considerable amount of money to set up two factories in Sepang and Banting. The Sepang factory was completed and opened in 2016 and the Banting factory will be opening soon. In addition, there is digital adoption within IBS. So, there is something called 3D Building Information Modelling (BIM) and a Common Data Environment (CDE). The BIM methodology is essentially designing a house or a condominium block in 3D space — think of it as virtual reality. Typically, when you do something, you are going to have conflicts, such as the pipe is going to hit the fan or it doesn’t match with a certain wall. All these conflicts, which otherwise would have involved the contractor hacking the wall and so on, is eliminated as everything is done in 3D virtual space. Every single conflict is resolved upfront. The digital scheme or blueprint will be transferred to the robots and the robots then carve out the panels exactly as they should be, whether it is a wall, a floor slab or the door frame. There will be no error because it is all laser-guided. When you do that, it is very efficient. There are no more conflicts and hacking of walls. Everything falls into place and the building can come up in half the time it takes. The big upshot is the digital aspect, using BIM married with robotic technology and that gives you the whole value proposition. It is in an assembly line setting so it is faster, reliable and more consistent. What are the challenges the company is facing in the current soft market and how is it overcoming them? The market is soft and we understand the issues such as affordability. I think what is important is that we need to innovate and deliver key value, and also to offer a level of distinction. Purchasers are looking for more value-for-money properties that will help them gain capital appreciation over the years as well as properties that are able to suit their lifestyle, surrounded by ample greenery. So we will continue to grow on our town-making principles to ensure that our products and townships provide good value proposition to our purchasers. With our new projects, we continue to raise the bar on all aspects of property development. In terms of operations, there is no shortage of media coverage on the rising costs — such as land, construction and labour — as well as the issue of delayed delivery and quality of the developments. To optimise efficiency, speed to market and value for end-customers, Gamuda Land has adopted Gamuda IBS in our current and future projects. What kind of growth do you want to see in the next 12 months? What is your strategy? We have already hit RM3.6 billion revenue and we want to have healthy growth from this point. Obviously, this involves the key firing of our growth engines, which is Gamuda Cove and Gamuda Gardens. Both townships have seen good response and take-up. The situation is similar with twentyfive.7. So, all the activation of growth engines is firing up and we are on track to achieving our target this year. Within that, there is also the importance of the overseas market, which I have mentioned. Both have to come in tandem and we are looking forward to another sterling year of growth. Consumers will be looking for good value-for-money properties. And value can be derived from well-planned developments in good locations that offer a beautiful environment with extensive facilities and amenities. Other properties that remain well received are transit-oriented developments with high future growth potential and landed properties in good locations. Knowing this, we will continue to build on our key development principles to deliver sustainable value creation and better customer experience for our customers.